Makes the Perfect Gift Idea: Quit searching for the best gift suitable for a housewarming, Christmas, New Year's or just because. No Hassle Installation: Each of this wall mounted or under cabinet stem racks are 5 inches wide, 11 inches deep and hangs 1 ½ inches below the cabinet. You can store up to 3 glasses in each row with a base up to 3 ½ inches. Works Like a Charm: These racks provide support for hanging up your glassware, so it protects your fragile collection from getting chipped or damaged. 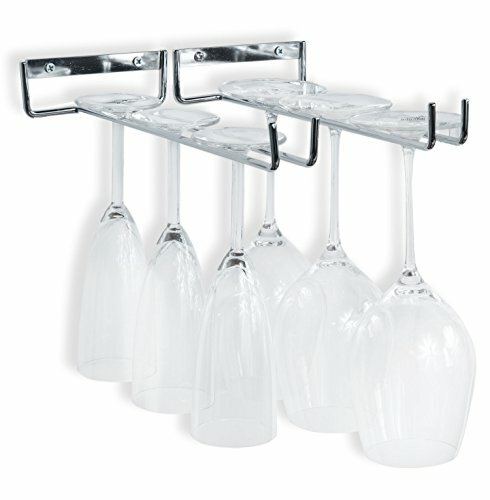 You can hang one or more of these racks to create additional storage space for all your glassware. Conserve Space: Neatly organize your kitchen cabinets and counter to work more efficiently when cooking for yourself or for your family. You can free-up valuable space and get rid of the clutter that's preventing you from finding what you need with ease. Collector's Rack: If you love collecting vintage wine glasses or fluted dessert bowls, this rack will be your favorite storage solution in the house. You can hang it on the wall space under your kitchen cabinets or anywhere that will satisfy your needs. Cost-Effective: With this set of 2 bundle you will get more for your buck and showcase your stemware with ease. Instead of investing in a credenza or buffet you can utilize this rack over your liquor cart to create your own bar storage without breaking the bank account.